Mr. Opelka doesn’t like this youthful and very modern response because he considers it an affront, overly informal, borderline rude and negative. I agree with him all counts. I don’t like “No problem,” however, because I always walk away wondering, “Does that mean if it was a problem you wouldn’t do it?” Do I get the individual’s service because he or she has taken a break in texting, tweeting, Instagramming, watching YouTube or—big stretch here—studying, to pay some attention to the job they’re being paid to do? “No problem,” does not make me feel like a valued customer; it tells me I’m an afterthought in this young’ person’s busy, busy day. I’m something he or she squeezes in between much more interesting activities. I don’t like that. Now, maybe I’m being picky. Perhaps I should stop looking for courtesy, good manners, undivided attention and appreciation for my business. I should just be grateful that the individual has bothered to respond to my “Thank you,” at all. 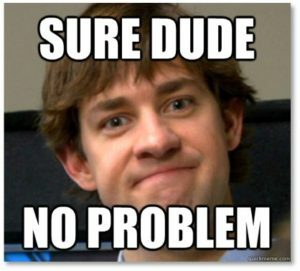 Are we going to move from “You’re welcome,” to “No problem” to “Yo, dude,” to complete silence? But it has been moving rapidly up the age ranks. I hear “Me and” from teens, college students and young adults. Presumably, NO ONE ever told them that this was an incorrect usage. Alternatively, someone did but they ignored the instruction because, hey, they’re special and the center of the universe so why shouldn’t they come first in a sentence? 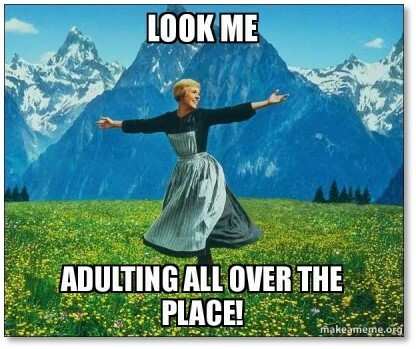 When I hear “Me and,” I wince and think that the speaker is really just an overgrown toddler who will have difficulty “adulting.” This new term, which changes a noun into a verb, means accepting adult responsibilities instead of clinging to childhood indulgence. 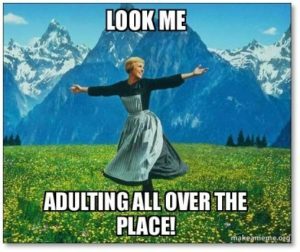 Young people take pride in adulting because it means they have become, you know, adults. In my world, however, adults don’t’ say, “Me and.” Perhaps they would have less difficulty adulating if they learned to speak like adults. I know I’m bailing against the tide on this one. In five years, maybe two, “Me and” will become accepted usage, taught in the schools by education majors who never learned — or paid attention to — proper grammar during their own educations. This trend perplexes those of us who learned proper English usage in school and were expected to use it properly in speech. 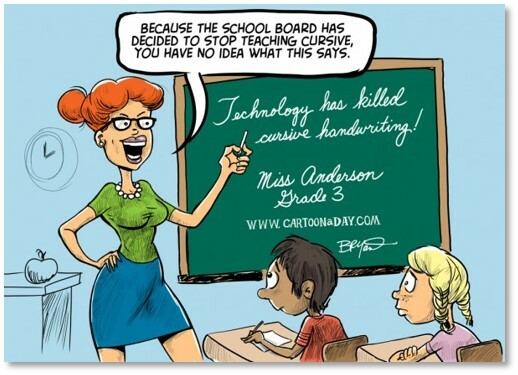 We don’t understand how young people could go from elementary school to middle school to high school to college without learning how to speak their native language properly. Back when I could spend a lot of time with my granddaughters, I worked with them on this because I wanted them to sound like the intelligent, thoughtful girls they are instead of valley girls. When I was working, I would also correct some of the young people on my team so they could communicate like grownups and professionals. Think of it as mentoring. So, I applaud Mr. Opelka and The Wall Street Journal for raising the “No problem” issue and giving it visibility. Not that I expect it to change anything, mind you. This is, after all, an ongoing battle. Also, Mr. Opelka’s article appears in a newspaper, which is not a medium that people who say “No problem” and “Me and” are likely to read. Ever. Maybe Mr. Opelka and I should make a video together and put it up on Instagram and YouTube. We can plan our video by writing to one another in cursive. 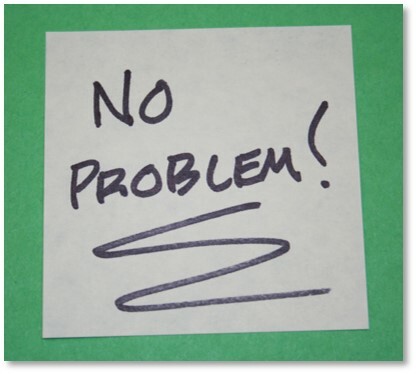 Then none of the “No problem” crowd will get an inkling of what we’re doing.